The V-mount IDX CUE-D150 Battery Kit with VL-4X Charger from B&H provides you with room to grow and expand as your battery needs increase. The battery provides a 146Wh V-mount battery which has a single D-Tap accessory port. It can support 10A loads, allowing you to power your camera or light while having plenty of power for accessories. The unregulated D-Tap supports a 50W draw while built-in protection circuits protect the battery from a variety of damaging power conditions. The VL-4X charger provides four battery bays for sequential charging. You can charge up to two batteries simultaneously when they are placed on opposite sides of the charger. Fold-down feet allow you to stand the charger upright, and although you cannot power a camera directly from the charger itself, the included AC power adapter outputs 90W and can be used to power a camera or the charger using the included 4-pin XLR cable. The VL-4X 4-Channel V-Mount Charger with Power Supply from IDX supports lithium-ion V-mount batteries and features sequential charging for four batteries, automatically switching to the second battery after fully charging the first, and it features simultaneous charging for two batteries when on opposite sides. It delivers up to 2.7A of quick-charge current without the noise of a typical charger thanks to a fanless design. This portable desktop charger is designed with reliable internal safety features that protect both the battery and charger from damage should faulty or misused batteries be placed on the charger. It will automatically stop charging if any attached battery reaches an overvoltage condition. It features a support stand to keep the charger upright on a flat surface. Note: Power Base (DC output) mode is not supported with the VL-4X. Power your camera or other pro video equipment with the IDX CUE-D150 147Wh Li-Ion V-Mount Battery. The battery can supply up to 16.8 VDC to the plate, and can also provide up to 50W to power accessories through the integrated D-tap output. CUE series batteries feature an internal pack design, which cradles each cell and isolates it in order to enhance reliability and safety. 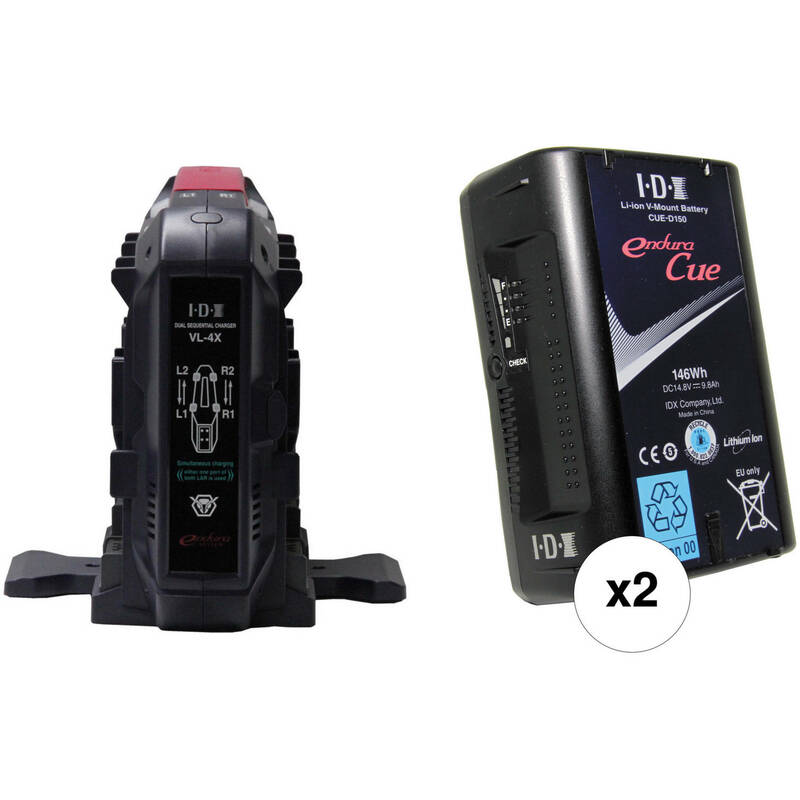 IDX CUE-D batteries should be charged using IDX-branded chargers; third party chargers may not charge CUE-D batteries correctly. Power Consumption 220 V Max. Box Dimensions (LxWxH) 7.0 x 4.45 x 2.8"